The Chandra X-Ray Observatory observes energetic emissions from the collapsed remnant of a stellar explosion. Can an electrical explanation provide a better scenario? "The neutron star, an extremely dense remnant of an exploded star consisting of tightly packed neutrons, is seen as the sphere at the center of the disk. 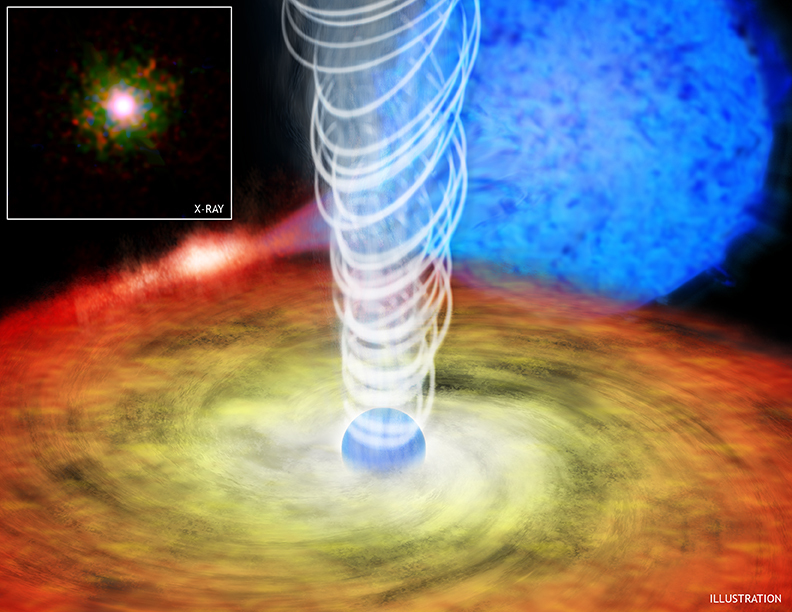 The powerful gravity of the neutron star pulls material from the companion star (shown as the blue star in the background) into a so-called accretion disk surrounding it. Through a process that is not fully understood, a jet of material moving at nearly the speed of light is generated. A high percentage of the energy available from material falling toward the neutron star is converted into powering this jet." Even though scientists have little understanding of what is going on in the case of Circinus X-1, they rely on gravity-only viewpoints for explanation. In the image at the top of the page, the emissions are shown in red, green and blue, representing low, medium and high energy x-rays. Two lobes of the jets are visible in the upper right, separated by about 30 degrees. The lobes are thought to be the result of precession in the star, causing a wobble that creates the two jets as it oscillates. Because the extreme density of the neutron star influences the intense gravitational field around it, the oscillation causes waves in the material being ejected. In standard astrophysical models, black holes were supposed to be the only objects in space that could compress matter to the point where it would be accelerated to relativistic speeds and release high-frequency electromagnetic radiation. The fast-moving photons would be expelled from the two poles of the black hole and glow brightly as gamma ray or x-ray light. Now, with the discovery of Circinus X-1, a theoretical model for neutron stars achieving that level of energy output has been proposed. The difficulties associated with black hole theories notwithstanding, previous Thunderbolts Picture of the Day articles have touched on the subject of neutron stars and discussed the various problems associated with them. Primarily, neutron stars violate the "Island of stability" principal. Plotting the number of neutrons against the number of protons in the nuclei of all elements demonstrates that the ratio is about one-to-one for light elements and one point five-to-one for the heavy ones. An atomic nucleus outside the range will spontaneously decay so that it reaches a stable configuration and remains in equilibrium. If there are too few neutrons the atom will emit protons in order to stabilize and vise-versa. A nucleus composed of neutrons alone would be completely unstable and immediately decay. In the electric star hypothesis, no exotic objects like neutron stars and no unproven forces such as concentrated gravity from hypothetical super-compacted objects and "singularities" are necessary. Electricity is more than able to create the phenomena we see from Chandra and other orbiting space stations. The two "lobes of the jet" can be viewed more simply as a glowing plasma cone seen in profile (the Red Square nebula, for example). It is the configuration of a plasma z-pinch, seen in supernovae remnants and planetary nebulae. 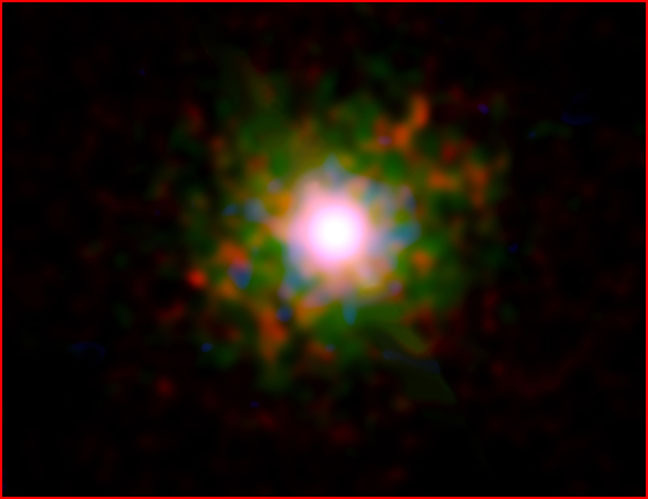 Expulsion disks are also common in such energetic systems. It is an assumption to call them "accretion" disks. Plasma discharge events are commonly known to generate high-energy UV light that is damaging to the eyes - from electric arc welders, for instance. The more electrical current supplied to the arc, the higher the frequency of light will be emitted. Supply enough power to the arc and x-rays and gamma rays are generated. Electricity is the force powering the stars - the more electricity that flows in to the star, the greater the effect on its output, causing powerful bursts of energy that are detected by instruments, like Chandra. The stars are anodes in a huge galactic circuit and the standard models for their behavior will always fail to adequately explain the observations.